Above is our tray of lettuce and arugula seedlings. 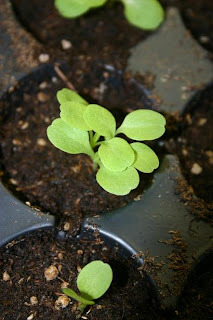 We'll be putting these into pots and growing lettuce in the solarium in a few weeks. Below is some bibb lettuce. Compared to the last time I grew this next to a window these plants that have been started in our germination and propogation station are very short and stout. I guess the lights are doing the trick. Next up, our intimidating list of things that we hope to grow this summer with some brief explanations. To start with, for my birthday, my mom ordered me lots of flowers for a shade garden to go on the north side of the greenhouse and a flower garden for cutting and for our bees. These flowers will be fenced in the vegetable garden area since there are a bunch of deer around here. Eventually I'll get around to landscaping the house with some deer resistant plants, but not this year. Next up, the vegetable garden. Some of the plants, such as the melons, peppers, and tomatoes will be grown both outside in raised beds and in the greenhouse as a bit of an experiment to see what they enjoy best. We're also planning to try and enrich the soil a bit by growing a lot of beans and peas this year to add some nitrogen to the soil. A green manure crop for the inpatient I suppose. I look at these lists of plants and think that we must be absolutely crazy to plan something this dramatic for our first real garden! But then again, the amount of work we're planning has got to be less work than raising children which millions of sane people do each year. At least the garden won't wake us up in the middle of the night. We also have plans to plant fruit trees (apple, pear, plum, cherry), berry bushes, grapes, potatoes and onion sets. Those things we'll be buying from a local nursery in the early summer when my mom is here to help with the labor. A cool website that I wanted to mention is Ample Harvest. This website links gardeners to food banks in their area that will accept donations of homegrown produce. I'm anticipating that we'll probably have too much of certain plants (and probably way too little of others) so we'll donate the extras to the food banks in town. Thanks for providing the link, I look forward to checking it out. We are definitely going to take your advice with the fruit trees. Since you're semi-close to us, do you have any ideas for places in the area to get mass quantities of compost for cheap or free? We've found a cheap local source for a fairly sandy soil ($105 for 10 cubic feet) to fill our raised beds but we would like to mix it with as much good organic matter as we can afford. I'm so sorry that I don't know of anyone close to you as we try to make our own as much as possible. If I were you I would check with any of my neighbers that have a few horses or cows and offer to remove their manure pile for them. People that do not garden are often more than happy to be rid of such things. Our neighbors have horses and no garden. How long does manure need to age before you mix it in with gardening soil? I would consider it safe after 60-90 days (some say up to 120), depending on what type of manure it was and where it came from. That is 60-90 days until you actually eat the crop that was grown in the soil. We often apply fresh manure in the fall and then till it into the garden in the very early spring. I think that if you were able to spread it out now and till it in sometime in March or April and did not plant until May and June you would be fine..especially with horse manure as it breaks down fairly quickly. We have done it this way with horse manure in the past. I would be more cautious with pig or chicken manure though. Thank you for mentioning AmpleHarvest. AmpleHarvest.org is a nationwide directory of food pantries eager for excess garden produces from the 43 million people in America who grow food crops in their home garden. Thanks Gary for that catch. That is the website I wanted to link to! A belated thank you for visiting and following my blog. Sorry it's taken me awhile to get over here. I have been plagued with this nasty flu. Anyhoo -- WOW! That is quite the list of goodies but I'm a huge believer in go big or go home. Happy to see that scarlet runner beans made it onto your lengthy list. Wow! Can't believe that list! Good for you. I'm betting your garden will be fantastic. I am also impressed by your list. I guess I have been at this long enough (35yrs) that I just plant the basics. We increased the size last year but it is in lasagna mode for another year or two, making soil. Happy gardening.